We have updated our major Asian holidays tip sheet schedule to include 2019 dates. 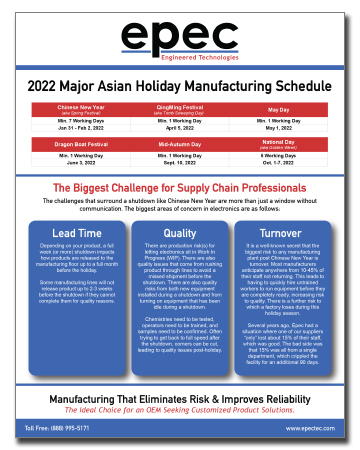 To better help you prepare, and to keep these dates top of mind, we have created this PDF document with all the major Asian holidays for you to print and share with your colleagues. The challenges that surround a shut down like Chinese New Year are more than just a window without communication. There is no way to avoid the holidays. The only thing you can do is plan for it. At Epec in preparation of the CNY, we start our production planning about 120 days before the start of the holiday. We’re very focused on making sure our suppliers and freight forwarders are very clear on our expectations and we are able to meet our customers’ requirements throughout these shutdowns.